Are you looking for a cost-effective swing tag to place on products that can be written on with a biro, ink pen or texta? 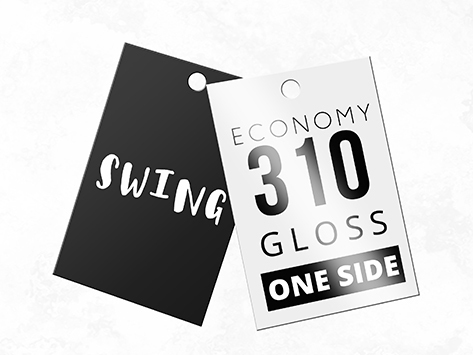 Then look no further as these swing tags are the perfect solution for you! Not only can you mark sizes or prices on the uncoated reverse, but you can use the gloss celloglazed front to present your brand professionally. Best of all, as these are printed on our Economy Class 310 stock, they offer excellent value for money! Download free templates to assist you in creating your file. Create quote for more quantity of product. Copyright ©2019 Fishprint. All Rights Reserved.